Let the knights and princesses come out to play at your next Medieval themed party. There will be wizards, dragons, knights, kings, and queens roaming the party just like it was in King Arthur's Court. Use our bulk Medieval decorations and costume accessories to dress up and make your party look like a medieval castle. The medieval renaissance party is one of the easiest parties to plan. This is because the theme is so broad. 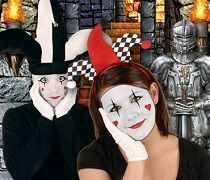 You can go with a King and Queen theme with knights and jesters. Or you can go more fantasy with dragon, wizards, and warlocks. The best way is to let your guests decide. 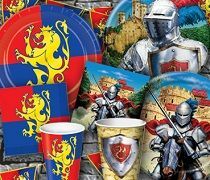 Simply announce that you are having a medieval party and order your castle decorations and bulk tableware like the plates, cups, and napkins with a castle image. Then you can let your guests wear whatever medieval costume accessories that they would like. Some will select king and queen crowns, while others might dress up as jesters. You might be surprised when a flying dragon knocks at the door looking to partake in the evening festivities. That is what makes this theme so much fun! You do not know who, or what will be coming through the door next. Are you trying to plan for a castle themed medieval party, or possibly a medieval fantasy party? Party Express has all of the Medieval party supplies decorations to decorate for the perfect medieval party. Choose from medieval party decorations, favors, and accessories – all at deeply discounted bulk prices. If you are looking to throw a medieval times party we have all of the castle back drops, medieval crests, and inflatable swords and shields that you will need. You might even find a large paper cutout of a knight standing in the corner. Make your party look like a castle with castle door and window props. We even have paper columns that look like the pillars of a castle. Decorate your tables with castle themed centerpieces and hang banners that look like family crests over the doorways. You can even serve your drinks out of jeweled goblets! Party Express has all of the party favors that you need to throw a one of a kind Medieval party and save you money buy selecting bulk party supplies and favors.